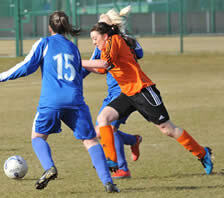 A new season, and a lot to live up to, but Champions Glasgow City picked up maximum points at home with a comfortable 5-0 win over Forfar Farmington at Glasgow Green. In difficult conditions of very strong winds, City controlled the match against a determined Forfar who worked hard to make life as difficult as possible for the Champions. City opened the scoring on the half hour mark when striker Lisa Evans wrong footed Fiona McNicol in the Forfar nets with a close range finish. It was just reward for Evans who had started well and was causing the Forfar right back in particular a number of problems with her pace. It took City until the second half before they could add to their lead. A late run into the box by full back Emma Fernon met an inch perfect pass from her fellow defender Leeanne Campbell to allow Fernon to score from two yards out. City’s next three goals all came from Emma Mitchell. The 17 year old City midfielder moved into a more advanced position in the second half and her team benefited greatly from it. 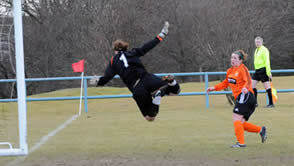 He first was a fine left foot strike into the bottom corner after being set-up by striker Suzanne Malone. Her second was a well composed finish, taking down a back post cross from Fernon before firing into the back of the net. Mitchell completed her hat-trick with another fine strike. Leanne Ross laid it back to Mitchell at the edge of the box and the young City midfielder again showed her prowess from distance firing a powerful shot home to make it a 5-0 win for City.